The "chester" and the "facial" are two volleyball terms used to describe how you can legally dig a ball by using your face or by using your chest. 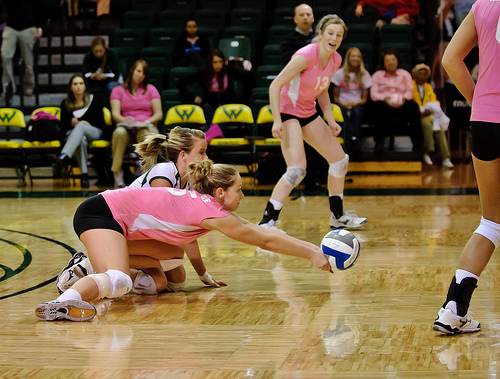 Words like "facial" or "chester" are key volleyball terms used to describe ways a player can legally dig a ball using body parts other than their hands. What does a "facial" have to do with how you dig a volleyball? One of the volleyball terms used to describe taking a spike to the face, is a facial which actually is a special kind of 'six pack'. When I say "special" I'm joking but still, it is similar to a six pack, because a facial describes what happens when a player digs a ball with their face. The difference between these two terms used in defense is that with a "six pack" a player will get hit in the chest or upper body area and since the ball made direct contact with their body without them getting their hands up in time to dig or deflect it, they owe the hitter a six pack of beer, soda or beverage of their choice. With a "facial" unlike the one you get when you pay someone to apply a cleaning solution to your face, the one in volleyball may sting a little, but then most players laugh it off, and keep playing. In case, you thought there weren't enough volleyball terms used to describe when a player gets nailed by a hard hit another common word used to describe this defensive action is the "chester." What does a chester have to do with how you dig a volleyball? A chester belongs in the same category as a 'facial' or 'six pack'. Its in the list of vocabulary terms in defense used to describe what happens when a player doesn't get their hands up in time to dig the ball. It describes what happens when a player gets nailed in the chest by a hard spike. The thing about a chester is that it isn't always whistled by the referee, especially if the ref decides that even though the digger didn't used their hands to contact the ball, the ball didn't come to a complete rest while it was on their chest. If the referee thinks that the 'chester' wasn't a ball that was 'lifted', in other words a ball that comes to a complete stop when its on the player's chest, then they'll allow play to continue. In this case the referee interprets the action as the ball having bounced off the player's chest which counts as one of the three contacts a team gets when trying to get it back over the net. So, to answer the question that I can hear you formulating in your head, the answer is "yes" there are times that play will continue even though a player contacted the ball with their chest instead of their hands. In each case, its up to the ref to determine whether play will continue or not. So the best thing you can do is keep playing, no matter what. You should keep playing the ball until you hear the referee blow the whistle indicating that the play has ended and that someone has earned a point, otherwise...keep playing!